Dr. Tague, as a member of UC Santa Barbara’s National Center for Ecological Analysis and Synthesis (NCEAS), collaborated on a new publication that will appear in New Phytologist this month (an early view of the publication is now available online), “Tree mortality from drought, insects, and their interactions in a changing climate”. 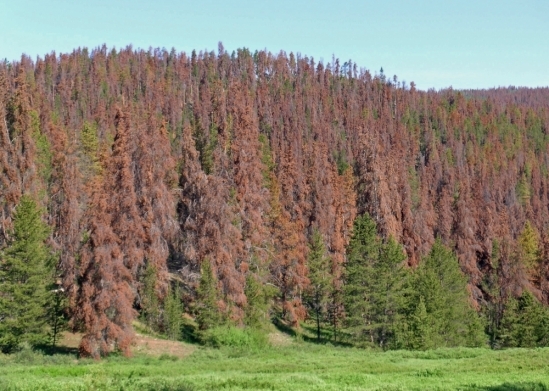 The study examines the interactions between drought and insects, and their impact on forest health. Dr. Tague appears in a UCSB press release highlighting the study’s research. Figure 1. 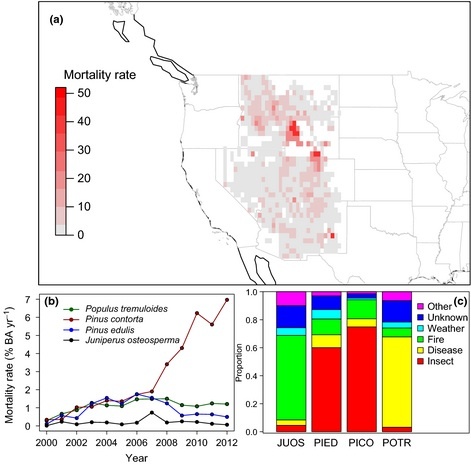 (a) Cumulative mortality rates (% basal area, BA) four major forest types (below) in western US forests averaged over 2000–2013, with fire-caused mortality removed from US Forest Service Forest Inventory and Analysis data. (b) Annual mortality rates (% BA yr−1) of major tree species in the western US from US Forest Service Forest Inventory and Analysis data. (c) Field-ascribed proximate cause of mortality that crews noted about individual dead trees in Juniperus osteosperma (JUOS), Pinus edulis (PIED), Pinus contorta (PICO), and Populus tremuloides (POTR) (Supporting Information Notes S1).